Adopted on March 3, 1988. South Dakota designated "Black Hills gold" its official jewelry on March 3, 1988, a reminder that, by law, only jewelry manufactured in the Black Hills can be sold under the name "Black Hills gold." 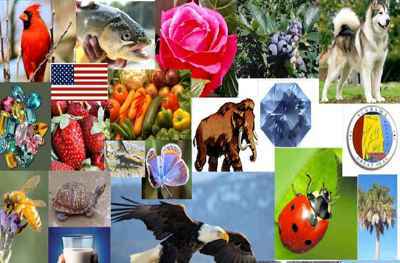 (Gold is also mentioned in South Dakota's state song.). Black Hills gold, the state jewelry, is created and manufactured exclusively in the Black Hills of South Dakota. 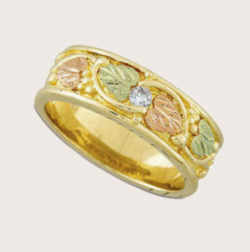 Each design incorporates the traditional motif of grapes and leaves in tri-color combinations of green, rose and yellow gold. Black Hills gold jewelry is a type of jewelry manufactured in the Black Hills of South Dakota. It was first created in the 1870s during the Black Hills Gold Rush by a French goldsmith named Henri LeBeau, who is said to have dreamed about the design after passing out from thirst and starvation. Black Hills gold jewelry depicts leaves, grape clusters and vines, and is made with alloys of gold with standard yellow gold as well as green and pink gold. In 1980, the 8th Circuit affirmed an injunction ruling that if a manufacturer was to call its jewelry Black Hills Gold, then it must be made in the Black Hills. The state of South Dakota designated Black Hills gold as the official state jewelry in 1988. The designs use grapes, grape leaves and grape stems and are easily recognizable for their distinctive colors. Silver is alloyed with the yellow gold to produce the green hue, and copper is alloyed with the yellow gold to make the red or pink gold. The jewelry was originally made with South Dakota-mined gold but in more recent years, since the closure of the Homestake Mine, the gold is sourced elsewhere. How is the jewelry manufactured in the Black Hill made? Pure 24 Karat gold bars, and stocks of pure silver and copper are the basic materials. These metals are not required to be mined in the Black Hills. Pure gold and other precious metal stock can be acquired from anywhere in the world. The finished jewelry known as Black Hills Gold must be produced in the Black Hills of South Dakota. The different colors of gold used for leaves and other details are made when the pure 24 Karat yellow gold is alloyed with copper to achieve the traditional 14 karat pink (or red) gold, and the gold is combined with silver to create the 14 karat green gold. The resulting gold bars are then readied for rolling. The cast pieces are then polished by one of two methods, either traditional hand polishing using a wheel, or a process called "tumbling." For tumbling: many castings at one time are placed in a tub or cylinder with different sizes and shapes of metal, rubber or other materials in a liquid solution, then agitated or rotated until they have been polished smooth. These smooth, cast pieces are then ready for the stamped components, like leaves and grapes, to be mounted on them. Some manufacturers, such as Landstroms, use the traditional method to attach the pieces, where the stamped components are individually hand-soldered to the cast gold frame using torches and karat-gold solder. Other factories place the solder and components together on the cast item, leaving several such assemblies in a soldering oven where they are soldered by the heat of the oven. The almost-finished jewelry is cleaned in a mild acid bath, then inspected using high quality standards. A finishing technique known as "wriggling" textures the leaves, creating a textured or frosty effect. 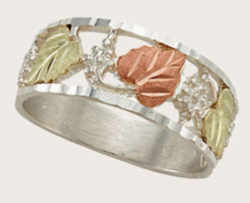 Each leaf vein is then hand-engraved for a brilliant, light-catching finish. 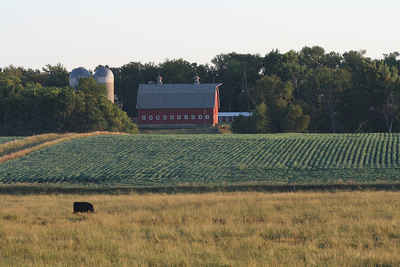 Peace of the prairies was no more when gold was discovered in South Dakota's Black Hills in 1874. A treaty with the Sioux Indians was broken as an influx of prospectors poured into the Sioux's sacred Paha Sapa, as they called the Black Hills, causing disturbances in the region while creating opportunities and radically transforming the region. The northern plains Indians were driven to war and to their demise. The 1875 Battle of Little Bighorn was decisive for the region's future, despite the defeat of General George A. Custer. American Indians were forced to cede the Black Hills and accept reduction in their reservation's area. The conflict cleared the way for further development. The last serious Indian-white conflict occurred in 1890; afterwards, barriers to settlement attenuated. 1874 - Gold discovered in the Black Hills on French Creek near the present city of Custer by Ross and McKay, two miners attached to General Custer's Military Expedition. 1876 - On April 9, Manuel Brothers, Moses and Fred, together with Hank Harney, discovered a ledge, an out-cropping of ore termed a "lead" (pronounced "leed"), in what is now the Open Cut. They named their claim "Homestake" and the mining camp which soon leaped to life took the name of Lead City. 1877 - Homestake claim and another totaling 10 acres were purchased from the Manuels by a group of mining men, who on November 5, incorporated Homestake Mining Company. 1878 - On July 12, 80 stamps weighing 750 pounds apiece started dropping in a new mill. The stamps had been hauled 300 miles by ox team from Sidney, Nebraska, nearest railroad point. January 22, Governing Committee of New York Stock Exchange accepted Homestake stock on the open market. First hoist placed in operation at B&M Shaft No. 1. 1880 - First railroad in the Black Hills was the Black Hills & Ft. Pierre, started by Homestake to bring cord wood fuel to the mills, shops and hoists, and timbers to the mine. Sold to Burlington Railroad in 1902. The line no longer exists. Homestake Hospital founded Black Hills Medical Center. First National Bank of the Black Hills founded in Lead primarily to serve Homestake and its employees. 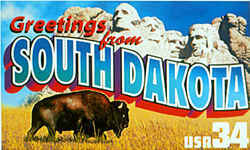 1889 - November 2, South Dakota admitted to the Union. 1-6-16.2. State jewelry. It having been judicially determined that the name "Black Hills gold" can only be utilized for jewelry manufactured in the Black Hills of South Dakota, Black Hills gold is hereby designated as the official jewelry of the State of South Dakota.